About a year ago, I mentioned that I would be spending a bit of time rewriting OpenOrienteeringMap (OOM). The web application, which people use to create printable simple “street orienteering” (or Street-O) maps for use in low-key events such as the SLOW Street-O series events, has been around for a bit, and was not the most intuitive or prettiest application to use. More seriously, the map creation process had little in the way of safety checking, meaning that mistakes could be made – one recent Street-O event I went to had two control points with the same number, and another one had misaligned the control “clue sheet”, so that the clues corresponded to the wrong control – resulting in much confusion out on the course. There was also a popular complaint from course planners – namely that they couldn’t go back and change their map – if they made one slight misplacement or misnumbering, they would have to start all over again from the beginning. A less frequent but still valid complaint was that it was easy for control numbers to overlap (or be near) other control circles, causing confusion. There was a non-trivial workaround for this last point. The new version, which I’m releasing today as a beta (while it awaits final signoff) addresses all these issues and has a few more features. If you want to jump right in, then have a play now at http://oomap.co.uk/ – or read on for more details of what’s new. Much more intuitive to use. Set a direction for the control number. 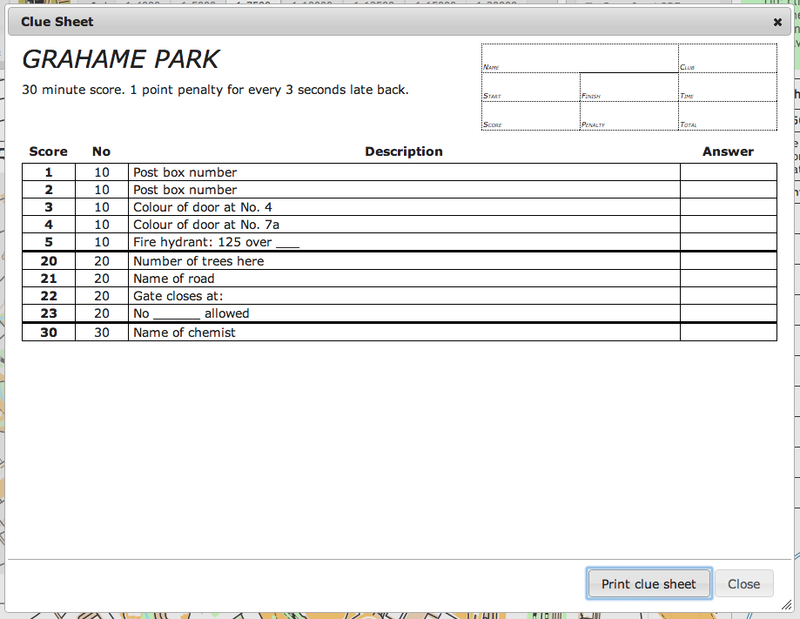 Set a point score and control description, for use with the new clue sheet. Edit and delete controls after they are created. Validator to make sure duplicate numbers are not entered! You now get given a code when saving a map. Copy this code somewhere, and use it to reload your map in the future. New clue sheet which can be edited and printed – useful in conjunction with the map, for an event. 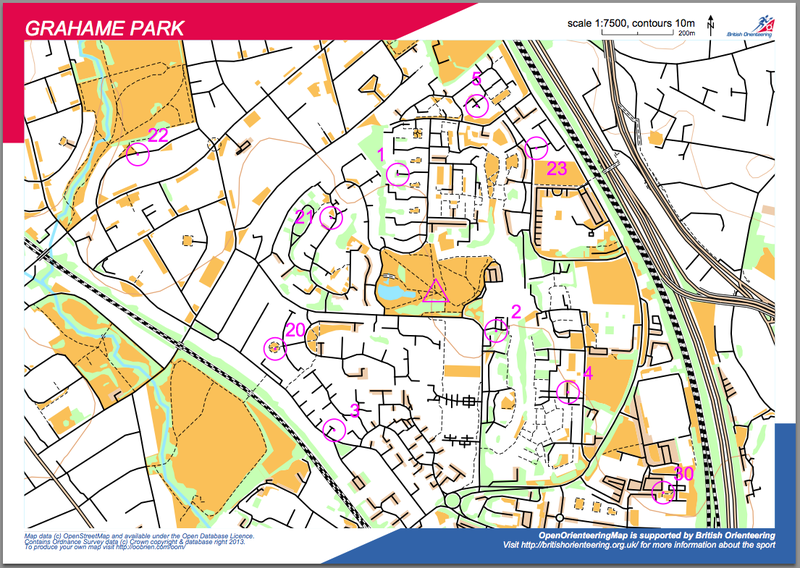 New design for the PDF maps – with British Orienteering branding. The standard Street-O map now shows parks (yellow) and forests (light green). If you don’t like them, use Street-O basic, which leaves them out, as well as railways. Daily updates to the background map. 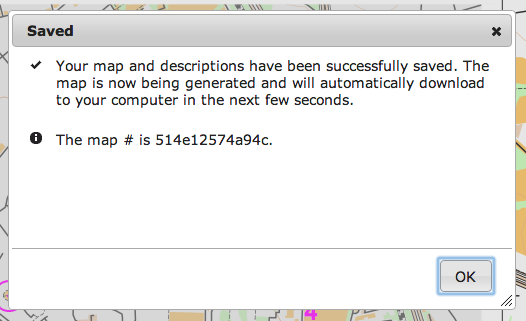 The local database is now updated from OpenStreetMap every day between 6am and 8am. During this time, OpenOrienteeringMap is not available for use – the maps on the website will appear partially or completely blank and PDF generation will not work. The map data is based on what is in OpenStreetMap up to and including 7pm the previous day. This means that edits to the background map in OpenStreetMap should take between 13 and 37 hours to appear in OpenOrienteeringMap. The image “tiles” of the map that you see on the OOM website are created on-the-fly from the local database and cached for quicker future viewing – the cache is emptied daily at the same time as the map data is updated. The PDF map is always created on-the-fly from the data, and not cached. The process is subject to occasional delays and may stop altogether for a while if upstream processes/timescales change. I’m using Geofabrik’s download service – thanks guys! Unfortunately this new version (and the old one) will only be available for the UK (& Ireland) at the moment. Partly this is because the new site is very UK-centric – it searches for UK postcodes, takes advantage of freely available contour line vectors for Great Britain, and is branded as a British Orienteering product. But the main reason is that the OpenStreetMap dataset for the whole world is huge, it’s unwieldy and almost unmanageable – not to mention requiring many hundreds of gigabytes of expensive server disk space, and a lot of RAM. The UK/Ireland cut, on the other hand, is much more straightforward to handle. 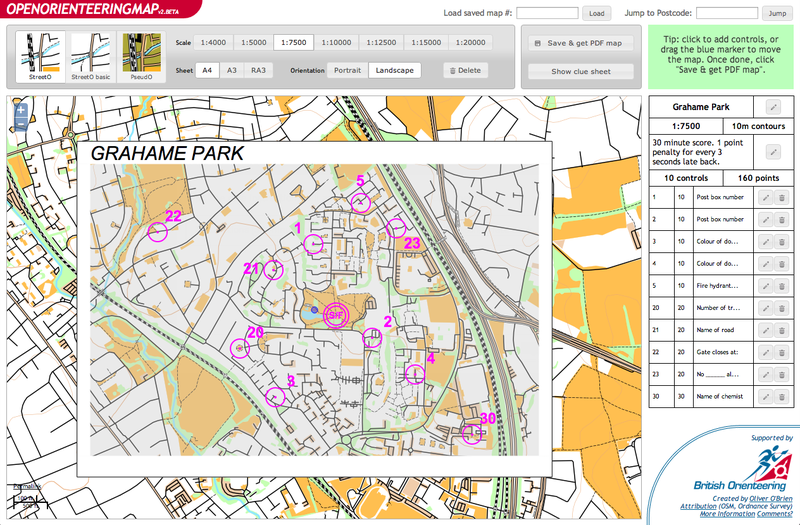 You can download this example PDF, which is of Grahame Park in north-west London, here. Get started making your own Street-O map, at http://oomap.co.uk/. Your comments are, as ever, welcomed below. Brilliant! The ‘score’ and ‘no’ columns are labelled back to front on the clues sheet – an easy fix I imagine! Are there plans to be able to make up a conventional point-to-point o course? Thanks Mike, and I’ve fixed that typo now. 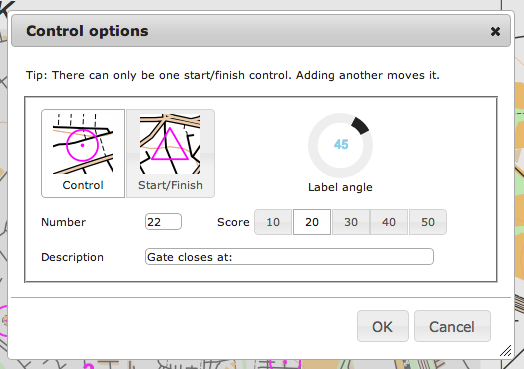 Point-to-point course functionality is certainly a possible for a future version. As it stands, the app creates the type of score maps used by SLOW-style Street-Os, but I appreciate that other clubs can run Street-Os on a point-to-point basis. OK – makes sense – thankyou. On the private route issue, can I ask how (whether?) OOM treats OSM route tags? Would simply changing e.g. the ‘pedestrians permitted’ tag to ‘prohibited’ in due course remove it from OOM? Not currently, because I’ve not implemented that rule on the stylesheet – I don’t think OSM generally uses that tag. There is an access=private, access=no and access=permissive, but these generally only restrict car access, not pedestrians (or runners) – in some cases (but not most) everyone is indeed blocked. barrier=gate is a similar problem. There’s not any immediate obvious solution, using OSM data. Removing these features would probably get rid of more good-to-run streets than genuinely OOB ones. I’m very much an OSM newbie, but for instance the footpath / footway and track seem to have several relevant tags. Perhaps you could email me direct so that I can send you a screenshot of what I am thinking of? Drop me an email at mail (at) oliverobrien.co.uk. NB on OSM you can choose the “Data” layer from the layer pop-out on the right (zoom in a lot first – it doesn’t like displaying many features at once) and then you can click on features to see their tags, without needing to drop into an editor. Such a cool tool! I would love to use this also in Sweden. Saw your note on data and server capacity. Is there a possibility to add Sweden, or other countries. Or is there a possibility to host this locally to use another data set? I’m not sure how commercial your work is and if you are willing to share. If not I will for sure use it when on business trips to UK. There is certainly the possibility to add other countries (particularly if they are relatively small, i.e. not Russia, Canada or the US, so that the data would actually fit on the server) and I’m hoping to put together a poll soon, so that people can vote on what country they would like next. Sounds interesting Ollie! Regardless how the votes goes – this find made my day! Impressed and inspired! I finally came back to your website and also read the mention about “UK & Ireland only”. A couple of people here in Belgium had been asking me about the site not working anymore, so now I have an answer for them. Very nice work and thanks for your help last time we did this in Brussels. I believe the organisers modified the generated clue sheet, making the font smaller, so that they could squeeze more clues onto it. However I agree that the horizontal lines could be made smaller – although HTML doesn’t I believe have subpixel resolution. Just noticed that OOM does not (now?) display islands that have (deprecated) tag natural=land, if they are not also identified as part of waterway=riverbank. Many islands on the tidal & non-tidal Thames (eg Swan Island http://www.openstreetmap.org/browse/way/44072053 & Trowlock Island http://www.openstreetmap.org/browse/way/26600935) are affected. a) I printed the map out on a black and white laser printer (more durable than my colour inkjet) and the purple control circles and numbers come out quite faint. An option to generate the map so they appear dark grey would be helpful, particularly for night events. b) Instead of using a randomly generated alphanumeric code to recall the map why not use one based on current date/time and map title. Posted this on the OOM comments by mistake so I have added it to the Beta comments in the hope that you will find one of them soon! I did a load of updates to OSM yesterday in preparation for an event tomorrow night. I thought I read somewhere that there was an automatic daily update done in the morning but nothing seems to have changed is OOM yet. Can you clarify the position regarding updates please?